Partnering with the right sales agent is critical to ensuring a seamless property purchase. As your local real estate expert, I know the inventory of homes and have a proven track record of negotiating on behalf buyers to get the right home at the right price. I communicate with you every step of the way to guide you and support your real estate needs. Simply fill out the brief form below to get started. I will contact you within 24 hours. 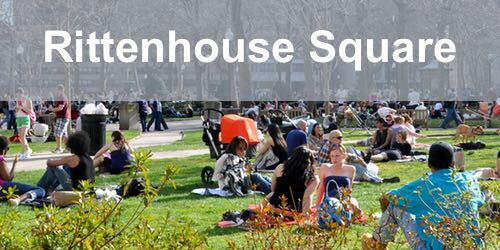 Rittenhouse Square, named after the park in its midst, is one of the poshest and most desirable areas in Center City Philadelphia. Surrounding the square are high-rise condos and luxury apartment buildings. Walk a few blocks south, east, or west, and you will find stately townhouses on tree-lined streets, lovingly restored trinities on smaller streets or mews, as well as lofts and condos. The neighborhood is home to some of the city’s finest shops, boutiques, and art galleries, and to many popular and trendy restaurants. Rittenhouse Square is also a cultural hub. Museums within a few blocks of the square include the Rosenbach Museum and Library, the Civil War Museum, the Mütter Museum, the Franklin Institute, the Academy of Natural Sciences, and the Philadelphia Art Museum. Residents can walk to performing arts events at the Curtis Institute of Music, Plays and Players, or the Philadelphia Art Alliance. 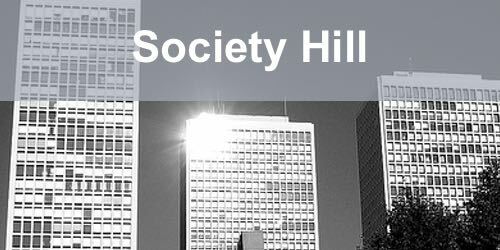 Society Hill, a highly desirable and historical portion of Center City Philadelphia, is bounded by Walnut, Lombard, the Delaware River, and 7th Street. The neighborhood consists of contemporary and historic townhouses—often side-by-side—along with high-rise condo and apartment buildings. Under a 1950s redevelopment plan, new townhouses were built on vacant lots, and historically significant houses were restored to conform to 18th century design. The Society Hill Historic District has the largest concentration of original 18th and early-19th century homes in Federal and Georgian style of any city in the U.S. Living in Society Hill puts you within steps of landmarks that date back to the birth of our nation: in addition to the renowned Independence National Historical Park, it contains many historically certified residential and commercial buildings. Society Hill also offers a vibrant community with schools, shops, parks, and playgrounds. The transformation of the neighborhood has attracted top restaurants. It also contains several lesser-known museums, and world-class performing arts centers are nearby. Washington Square West puts the conveniences of urban living right at your doorstep. Located in Center City Philadelphia, just west of Society Hill and east of Avenue of the Arts, the neighborhood extends from 7th Street to Broad, and Walnut to South Street. Housing in the community includes historically certified and contemporary townhouses, high-rise condominium buildings, and smaller row homes on side streets. The neighborhood was added to the U. S. Register of Historic Places in 1964. 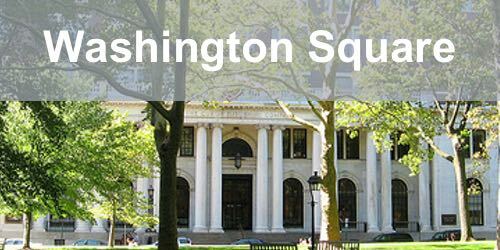 Washington Square West is adjacent to Independence Mall. Among the area’s attractions are Philadelphia’s Antique Row, Pennsylvania Hospital (the nation’s oldest hospital), and the Tomb of the Unknown Revolutionary War Soldier. The neighborhood is noted for unique shops, including those along Antique Row, great restaurants, and coffee shops. Nearby are the Walnut and the Forrest theaters, two of Philadelphia’s leading venues for original productions and Broadway shows. Avenue of the Arts, located along Broad Street from City Hall south to Washington Avenue, is home to much of Philadelphia’s cultural life. Most of the residential inventory on or near the Avenue of the Arts consists of high-end condo buildings or well-designed conversions of older apartment buildings to condominiums. A recent redevelopment initiative focused on beautifying and relighting the street, attracting new construction of theaters and residential buildings, and creating an environment that is inviting, safe, and user-friendly. 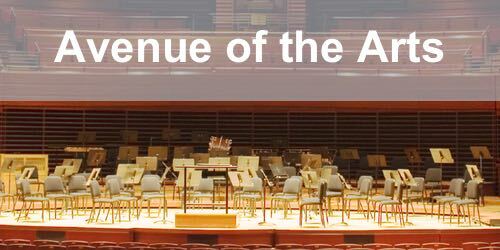 The Avenue of the Arts section contains many important cultural institutions, including the Kimmel Center, the Academy of Music, the Merriam Theater, the Wilma Theater, and the Suzanne G. Roberts Theater. Also along the row is the University of the Arts, which uses the Merriam for many of it productions. With a vibrant performing-arts scene and outstanding restaurants, the Avenue of the Arts is a great place to live. Bella Vista is a neighborhood with old-world feel. It is just west of Queen Village, between South Street and Washington Avenue, and 6th and 11th streets. Residences are primarily two- and three-story row homes on well-kept streets. The area is home to the Italian Market, which offers fresh meat, fish, cheeses, baked goods, produce, and much more. The Market’s storefronts and outdoor stalls are staffed by friendly, long-established merchants. 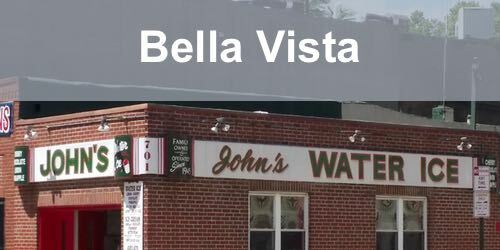 Bella Vista is known for its annual festivals, including the Italian Market Festival and the Bella Vista Fiesta. Residents can join community gardens, a community recreation center, or a bocce league. Restaurants, ranging from casual to formal, feature every type of cuisine, while bakeries and Italian-ice establishments satisfy dessert cravings. Bella Vista is close to the southern end of the Avenue of the Arts, which puts fine and performing arts within walking distance. It’s also only five minutes from the city’s major sports venues: Citizens Bank Park, Lincoln Financial Field, and the Wells Fargo Center. 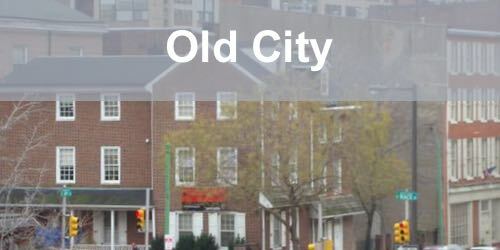 Queen Village is a conveniently located neighborhood adjacent to Society Hill in Center City Philadelphia. It is bounded by the Delaware River and 6th Street on the east and west, and South Street Washington Avenue on the north and south. The housing inventory is varied and includes modern town houses, restored trinities, condos on the waterfront, historically certified brownstones, and multi-family dwellings. 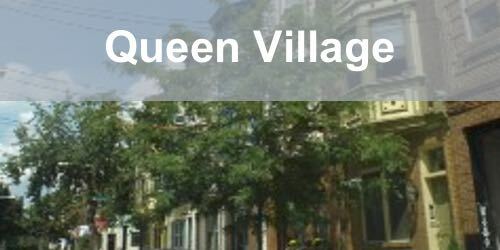 Queen Village contains scores of popular restaurants and pubs, as well as charming boutiques and galleries along South Street. Independence Hall, the Delaware River waterfront, and the Italian Market are all within walking distance. The neighborhood elementary school, Meredith, is one of the highest ranking elementary schools in the city—it has consistently high test scores and a caring and committed staff. Settlement Music School and Fleisher Art Memorial offer training in the arts at all levels. 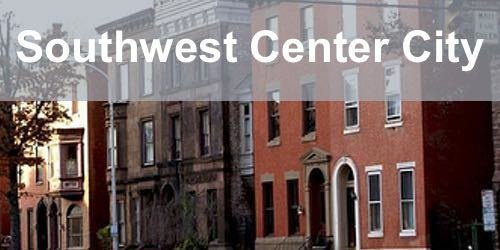 Southwest Center City is a neighborhood of many names—Graduate Hospital, G-HO, South of South, So-So, Naval Square, Schuylkill Southwest. 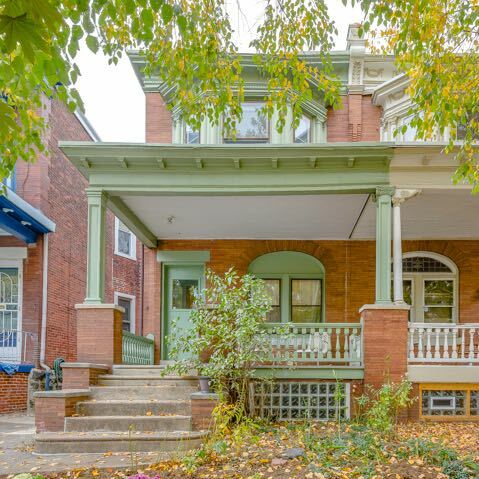 Bordered by South Street, Washington Avenue, Broad Street and the Schuylkill River, it consists primarily of nineteenth- and twentieth-century row homes, but newer condominiums and single-family homes are also available. As the neighborhood has grown, it has attracted new businesses, services, and restaurants. It is within walking distance of University City, home to the University of Pennsylvania, Drexel University, and the University of the Sciences. Fishtown is both one of the oldest and newest neighborhoods adjacent to Center City Philadelphia. Its borders are the Delaware River, Frankford Avenue, and York Street. Once a center of the Delaware river fishing industry, the neighborhood has seen a recent rise in new construction of townhouses and innovative condo conversions from warehouses and industrial buildings. The newer buildings are nestled among century-old row houses of varying architectural styles and sizes, ranging from tiny trinities to large three-story structures. Along with new housing have come businesses, including pubs and restaurants. A popular Fishtown location is Penn Treaty Park, where families can picnic, attend festivals and other special events, enjoy the river, or watch holiday fireworks just south of the area near the Ben Franklin Bridge. 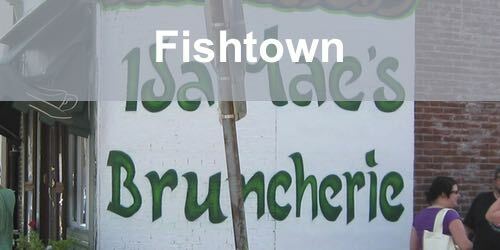 One of Fishtown’s greatest assets is its accessibility to Center City by car or public transportation, and to the airport, ballparks, and points north via I-95. Old City is a Center City neighborhood that blends the old and the contemporary. Its boundaries are the Delaware River to 6th Street, and Vine Street to Walnut Street. 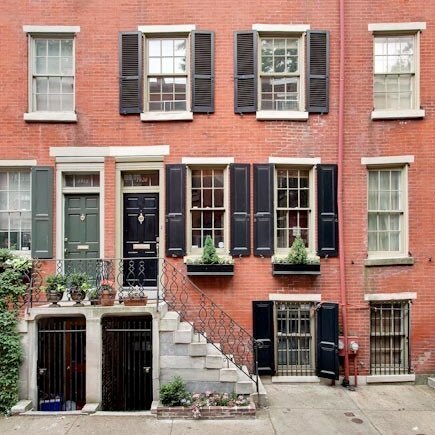 Housing choices include delightful restored trinities on historic alleys and mews, lofts and condos in converted factories and office buildings, and traditional brick-front row houses. Some of the streets still have cobblestone surfaces. Among the historic attractions in Old City are Elfreth’s Alley, Old Christ Church, Betsy Ross’s House, and Independence Hall National Historical Park. Newer attractions include the United States Mint and the National Constitution Center. Old City is also home to the Arden Theatre, as well as art galleries, clubs, and restaurants. A monthly First Friday event brings visitors to open houses at galleries and boutiques. 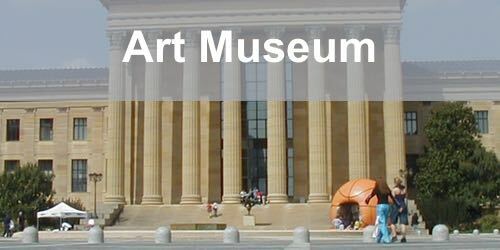 The Art Museum area of Philadelphia is generally considered to encompass the area along the Benjamin Franklin Parkway from the Eakins Oval, at the foot of the Art Museum steps, southeastward to Logan Square/Circle between 18th and 19th Streets. North and west of the area along the Parkway are several residential communities, including Fairmount and Spring Garden, with brick row homes, stately mansions that have been converted into condos, and high-rise condo buildings with spectacular views of the Benjamin Franklin Parkway and the city beyond. The area along the Parkway contains public buildings and museums, including the Franklin Institute, the Academy of Natural Sciences, the Free Library of Philadelphia’s main branch, the Rodin Museum, the Phildelphia Museum of Art, and the Barnes Foundation Museum. The area boasts several fine restaurants and pubs. Fairmount is a community at the edge of Center City. Its boundaries are Vine Street to Girard Avenue, and Broad Street to the Schuylkill River. 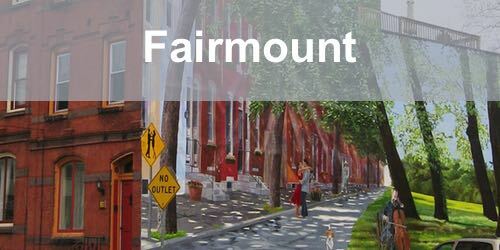 ͞Fairmount͟ is also an umbrella name for several smaller neighborhoods within those boundaries—Spring Garden, Franklintown, and Francisville—each with its own ambiance. Housing includes stately townhouses on tree-lined streets, loft condo conversions in former factory buildings, contemporary high-rise condo buildings, and smaller row homes (both historical and modern). Many areas and buildings are on the National Register of Historic Places. Residents have easy access to the many museums along the Benjamin Franklin Parkway in the Art Museum section. Another popular attraction is Eastern State Penitentiary, which held Willie Sutton and Al Capone when it was still operating. Today you can visit restored areas of the prison and enjoy its Bastille Day reenactment or guaranteed-scary Halloween event. Many fine restaurants and pubs are located in Fairmont. 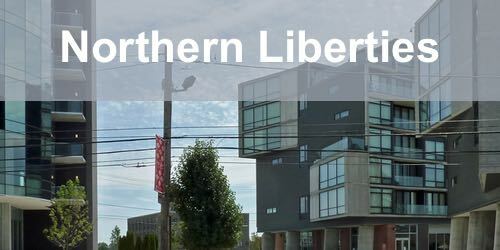 Northern Liberties (AKA NoLib), extending from Girard Avenue to Callowhill Street, and from the Delaware River to 6th Street, is a hip area adjacent to Center City Philadelphia. The community consists of traditional and contemporary townhouses, as well as loft/condo conversions and new-construction condos. The neighborhood is very walkable and features two privately owned parks. Northern Liberties has a wide variety of pubs, restaurants, and nightspots. Among its historical sites is the Edgar Allen Poe House. One of the newest attractions is The Piazza, a neighborhood revitalization project located on the site of the former Schmidt’s brewery. Surrounded by new apartment buildings, boutiques, and restaurants is an 80,000-square-foot open-air plaza where free community events are held year round. A restored trolley-car line runs along Girard Avenue, and you can ride on vintage trolley cars to the oldest zoo in the country, the Philadelphia Zoo. With over a decade of experience helping buyers purchase properties in metro Philadelphia, I have built strong relationships in our community. 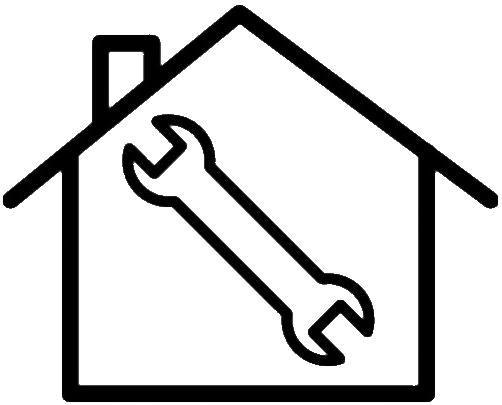 From mortgage lenders and home inspectors to repair contractors of several types, I offer a list of tried, trusted resources for your convenience. Why The Jonathan Fink Group?